In the last century, we’ve gone from the introduction of household electricity to lives that often wholly depend on it — a fact that is struck home every time we open a new utility bill. While making that payment each month certainly beats the alternative (roughing it may make an exciting camping trip, but everyday life demands hot showers and air conditioning), it doesn’t take much of the sting out of the cost of daily living. Especially when you start adding other bills — like costly cable and internet services — onto the pile. Happily, there may be a credit card that can help. With the right rewards credit card, you can earn rewards on every payment, making that monthly reality check a little easier to bear. One of the simplest way to earn rewards on your bills and utilities is with an all-purpose unlimited cash back rewards credit card. No categories to track, nothing to activate, just a flat earnings rate on every new purchase. The Chase Freedom Unlimited® not only offers unlimited 1.5% cash back on every card purchase, but it also comes with an introductory 0% APR offer and a solid signup bonus. Plus, your cash back can be turned into Ultimate Rewards® points if you have a Chase Sapphire Preferred® Card or Chase Sapphire Reserve®. If you’re over the 5/24 limit for a Chase card, the Capital One® Quicksilver® Cash Rewards Credit Card has the same credit card benefits trifecta as the Chase Freedom Unlimited®. You’ll get unlimited 1.5% cash back rewards on top of an intro-APR offer and an attainable signup bonus. While the Citi® Double Cash Card doesn’t have an intro-APR offer, it does have a decent signup bonus. It also provides a little more cash back than your typical unlimited card, but you don’t get the full 2% cash back at once. Instead, you’ll earn 1% when you make a purchase and an additional 1% when you pay it off. Depending on the amount you spend on bills and utilities each month, it may be worthwhile to seek out a card that will offer you bonus rewards specifically for utility purchases. Some of these cards offer as much as 5% rewards for qualifying bills and utilities, which can make a big difference when you’re staving off the summer heat. The Chase Freedom® operates on a rotating category system that offers new bonus categories each quarter. Although the Chase Freedom® doesn’t offer bonus rewards for utilities year-round, you have a pretty good shot of earning 5% on certain bills and utilities, like internet, cable, and phone services, at least one quarter a year. Cardholders of the U.S. Bank Cash+™ Visa Signature® Card can earn up to 5% cash back on utilities by selecting “Home Utilities” as a 5% cash back category. Furthermore, you can also earn up to 5% cash back on your cell phone bill by selecting “Cell Phones” as your second 5% cash back category. You’ll need to select/activate your bonus categories each quarter, with the option to choose new bonus categories every three months. Bonus category rewards are earned on the first $2,000 in combined eligible net purchases each quarter. With the Voice Credit Card® from Huntington, you can earn 3X points per $1 spent paying your bills by selecting “Utilities & Office Supply Stores” as your bonus rewards category. Points are worth 1¢ apiece, giving you an effective 3% back on utilities. Your bonus category is selected each quarter and you can choose the same category or pick a new category if you have other big expenses coming up. Bonus rewards can be earned on up to $2,000 in qualifying category purchases each quarter. As much as we may complain about the cost of consumer utilities, keeping your business’s lights (and phones, and heat) on can be a fairly large chunk of your overhead. But you can take a little weight off your business’s bottom line with a good rewards credit card. In the modern digital era, keeping your business connected can make all the difference. The Ink Business Cash℠ Credit Card can help you stay in touch by providing 5% cash back rewards on internet, cable, and phone services, as well as office supply stores, on up to $25,000 in combined purchases each account anniversary year. For the business owners who prefer points, the Ink Business Preferred℠ Credit Card offers 3X points per dollar on internet, cable, and phone services. Cardholders can also save on other key business bills, including shipping purchases, travel, and qualifying digital advertising. Category rewards are limited to the first $150,000 in combined purchases each account anniversary year. Whether they come to you through email or snail-mail, few of us enjoy seeing the latest monthly installment of our utility bills. Of course, most of us would still rather pay our bills than spend a summer without air conditioning. With a well-chosen rewards credit card, you can earn cash back or points on every payment, taking a little of the sting out of keeping all those modern conveniences up and running. 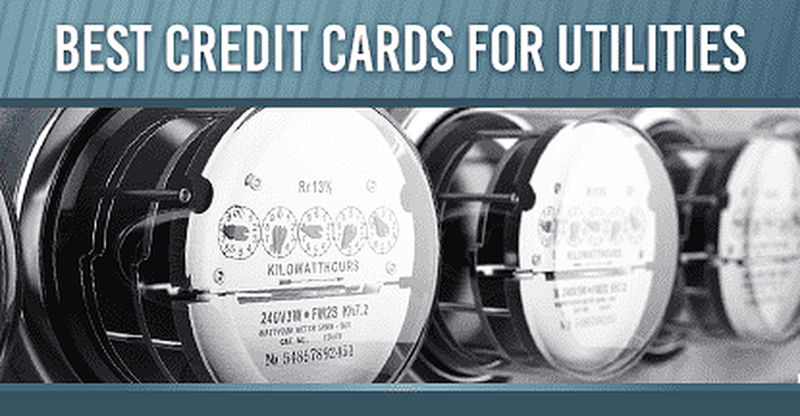 One thing to note is that some utility providers, most commonly electric and water services, may not allow bills to be paid with a credit card, and those that do allow it may charge a significant fee. Be aware of any potential fees or restrictions before making a payment to avoid unpleasant surprises.